AshleyNewell.me: Freebies are Great for Business! Freebies are Great for Business! I recently bought an Orange Dream sickle body wash from PegasusSoaps. To be 100% honest, I actually needed a new body puff because mine was disgusting and I saw in the picture, she included a puff when you bought a bottle of body wash. That and the fact that she had my all time favorite scent sold me on the product. I got the body wash within days of ordering. This is something I ADORE! Fast shipping is the best! I wasn't even expecting it to come so soon and all the sudden, there it was. It smells really good. The consistency is a little thinner than I'm used to, only because when I got pregnant, my skin was SO dry that I switched to the extra moisturizing stuff. However, my skin isn't that dry anymore so I don't need that much moisture. Thinner body washes are better for summer too, in my opinion. They leave you feeling fresher and cleaner whereas a thicker one feels a tiny bit filmy on your skin. Anyhow, the body wash foams really well and I love how the scent lingers on my skin. I've never had a body wash I could smell once I got out of the shower. 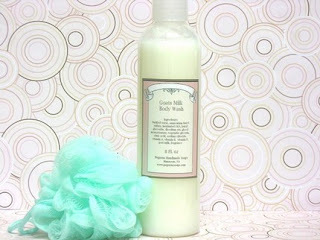 In my package from Pegasus Soaps, I also received a sample bottle of their lotion in their "Clean" scent. I absolutely, love love love this lotion. It is so thick and moisturizing! I wash my hands a lot since my son is always getting messy and the lotion really keeps my skin nice and soft. Now, I never would have known about the lotion if I hadn't got the free sample. I never even noticed it on the site, I can be very one track minded. But now, I have a new favorite lotion and I will be back to order more! So, as you can see, Pegasus Soaps really has the right idea. From including a free puff when you order body wash to draw a customer in to including a sample of a wonderful product in their package (which was very cute, BTW), they know how to draw a customer back into the store. I will take a hint from them and start implementing these things in my shop.